Britain's post-war housing estates were borne from utopian ideals. The days of mouldy Victorian terraces were over: replacing them would be elevated communities in flats with all mod cons: cosied by central heating, blessed with stunning views and boasting pleasant green spaces in which to socialise. What could possibly go wrong? Cut to the modern day and the estates that survive are, for the most part, graffiti-covered hellholes with pissy lifts. The scared residents that remain have barricaded themselves behind steel security bars and the social spaces are occupied by bored and hostile kids. Culturally these places are now bywords for neglect and criminality - and make excellent backdrops for low budget horror and gangster movies. Kandinsky's Trap Street tries to explain why this happened, the effects the transformation had on long-term residents and the consequences of the estate's demolition and redevelopment. The vehicle for this is the story of the first family to move onto the fiction Austen Estate in Bermondsey, whose story we follow from their arrival in the early 1960s to the demolition of the estate in 2017. The story centres on Valerie and her daughter Andrea (both played by Amelda Brown). Their story is one of slow disillusionment with the social systems designed to take care of them, with Valerie fighting a Sisphyean battle against the estate's social collapse and, in 2017, the now elderly Andrea struggling to sell up for a reasonable price and remain in the neighbourhood. Trap Street tells a half-century long, cross-generational saga with impressive ease. But this story is just one facet of an information-dense tapestry that includes dramatisations of how the view of estates shifted in the media, from a bright n' perky Pathé film introducing this wonderful new housing philosophy to a Clockwork Orange parody that shows the increasing suspicion the public had of the estates. For me, the show was most affecting when it dramatised the contemporary housing situation. Andrea is taken on a virtual reality tour of the 'next' utopian ideals in housing, which are priced at about £1 million a flat. Andrea nervously enquires about the 'affordable housing' she's heard about - only to be informed that 'affordable' is defined as 80% of market rates. Do the maths, then wonder to whom that's supposed to be affordable? Perhaps the true tragedy of Trap Street is that the decline and criminalisation of these estates was never inevitable. The Barbican Estate was constructed on precisely the same utopian philosophy by architects Chamberlin, Powell and Bon, working from Le Corbusier's ideas. With its lush green spaces, hanging baskets, fountains and multiple residential/cultural facilities, the Barbican Estate is still very much in demand. Meanwhile, down in South-East London, the similarly designed Thamesmead Estate lives up the stereotype: damp-stained and litter-strewn with seriously bad vibes. It's no wonder that Chris Cunningham shot Aphex Twin's iconic Come To Daddy video here. The difference is that one houses the poor and one the rich - you don't have to think too hard to work out which group have been preyed upon. While the wealthy Barbican Estate residents largely own their flats and happily fork out for an army of caretakers, gardeners and maintenance workers, the Thamesmead residents have suffered the consequences of 35 years of ideological warfare against social housing. The most effective weapon in the Government's arsenal is that councils are obliged to send half their rents and the vast majority of their profits from house sales directly to Whitehall. This means there simply aren't the resources to improve or maintain conditions: the buildings are left to decay until they're demolished and replaced by glittering (and empty) luxury flats. The developers ensure the right people get a nice wodge of cash in their back pocket, while communities are scattered to the winds. Just around the corner from the theatre there's a large piece of graffiti scrawled on the Euston Road Underpass which reads "People are living in tents and million pound flats lie empty!" Couldn't have said it better myself. And if you want a more visceral look at the consequences of chronic underfunding and social stigmatisation just hop on the tube for twenty minutes, get off at Latimer Road, and take a sobering look at the burnt out husk of Grenfell Tower. But despite all this misery and horror, and the most viciously targeted policies of successive governments, the dream of utopia still lingers in the imagination. The V&A recently announced that they're taking an eight-tonne fragment of the demolished Robin Hood Gardens estate to the Venice Biennale. This will be displayed on an outdoor scaffold, allowing visitors to stand on the iconic 'streets in the sky' as they look out onto the classical beauty of Venice, intended to make people reconsider how these architectural ideas can “can inform and inspire current thinking”. So aaaanyway, back to Trap Street, which is great. The cast, Amelda Brown, Danusia Samal and Hamish MacDougal are all great. The live score by Zac Gvirtzman is great. Joshua Gadsby and Naomi Kuyck-Cohen's set design is great. And writers/directors/producers James Yeatman and Lauren Mooney have clearly done their homework (for the sake of completeness, they are also great). 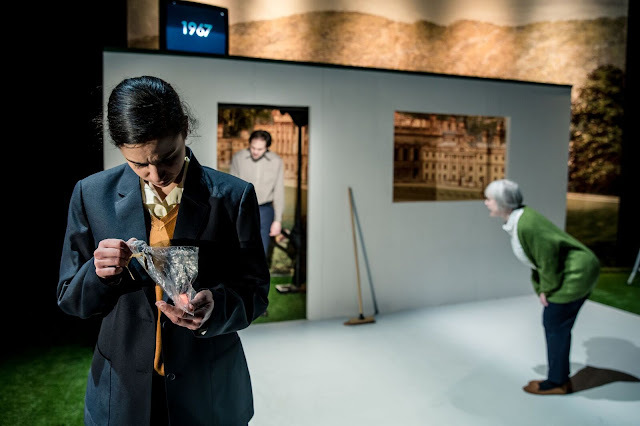 With Trap Street Kandinsky further solidifies its reputation as the go-to theatre company for political and social theatre free of stodge and preachiness. I can't wait to see what they tackle next. 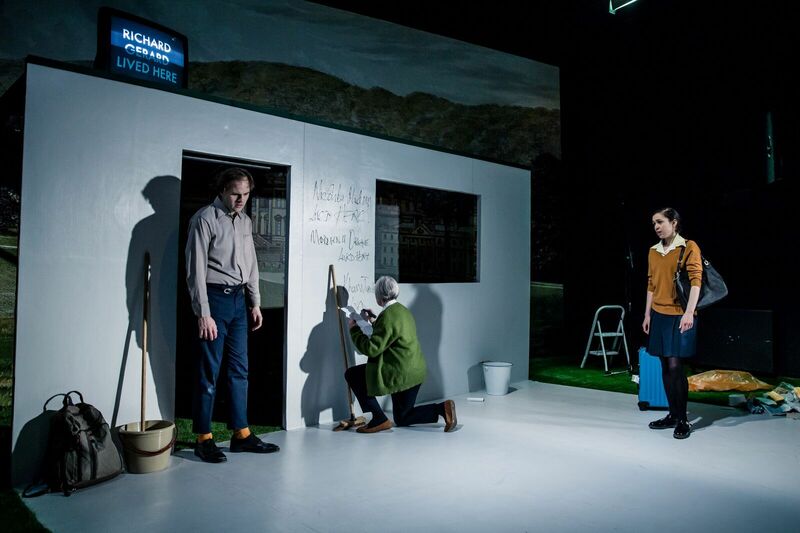 Trap Street is at the New Diorama Theatre until 31st March. Tickets here.